Born in Georgia in 1886 and touring the South at the age of 14, Ma Rainey learned quickly how to bring down the house. “By all accounts, she electrified her audience,” Sandra Lieb wrote in her biography of Rainey. 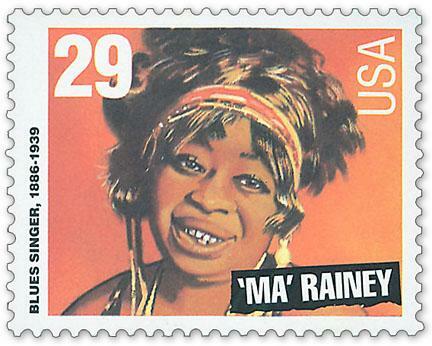 A woman in a male-dominated music genre, Rainey was known for her extravagant performances, gold-capped teeth, diamond tiaras, ostrich feathers, and a necklace made of dollar coins. In 1923, she signed a contract with Paramount and became one of the first blues singers to produce a record. She was married to a man, a Vaudeville performer with whom she toured. Still, rumors about her lesbianism followed her. The lyrics of the songs she wrote were often about women who “celebrate their right to conduct themselves as expansively and even as undesirably as men,” according to Angela Davis in her book Blues Legacies and Black Feminism. While touring she met Bessie Smith and gave Smith a spot in her show. The two women were notoriously wild, and there were rumors about a relationship between them. An incident mentioned in Chris Albertson’s biography of Smith involved Rainey. In 1925, Rainey “and a group of young ladies had been drinking and were making so much noise that a neighbor summoned the police.” The police showed up “just as the impromptu party got intimate,” and all the women fled except for Rainey herself. She was arrested for indecency and bailed out the next day. The legend is that this arrest inspired her single “Prove It on Me Blues,” an amazing piece of music with explicitly lesbian lyrics. After singing “I wear a collar and a tie,” Rainey gets to the point. If the lyrics didn’t make it obvious enough, the ad copy sure did. It showed three women, one of them wearing a vest, coat, and tie, while a cop watched from the other side of the street. Few of her other songs were that explicitly lesbian. 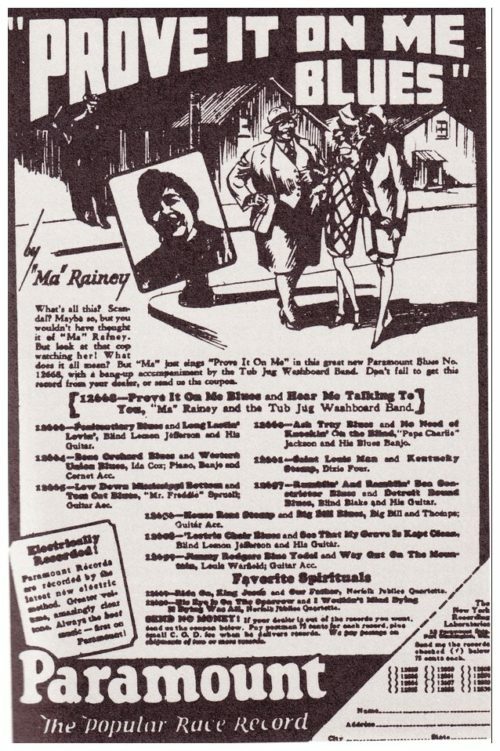 “Shave ‘Em Dry Blues” in 1924 mentions “Some women walkin’ State Street like a man” and “State Street women wearin’ brogan shoes” (brogan shoes are a type of military boot, and they were seen as men’s clothes in the 1920’s).